This recipe is ridiculously fast and easy to make, so it’s perfect for lazy days when the very thought of cooking makes you frown. And they’re packed with a one-two punch of garlic and ginger, followed by a touch of lime that tingles the tongue. The natural sweetness of the shrimp complements the citrus, and the touch of char from the grill is a nice partner for the firm flesh of the seafood. Speaking of… you can also use this marinade on fish, crab, or other seafood. Make the marinade. In a small bowl, squeeze the lime to extract the juice, then add the red pepper flakes, garlic, ginger, salt, black pepper, and cilantro. Mix well with a fork, then drizzle in the oil, stirring constantly. Prep the shrimp. With a small, sharp knife, pierce the shrimp at the head end and carefully cut along the back toward the tail, removing the dark vein. Rinse in running water. Pat dry, then place the shrimp in a medium bowl and mix with the marinade. Cover tightly and refrigerate for 20 minutes. Grill the shrimp. Preheat the gas grill on high heat with the lid closed, about 10 minutes. Thread the shrimp on skewers, leaving a little room between them so they don’t steam. Grill 2-3 minutes per side with the lid closed. No grill? 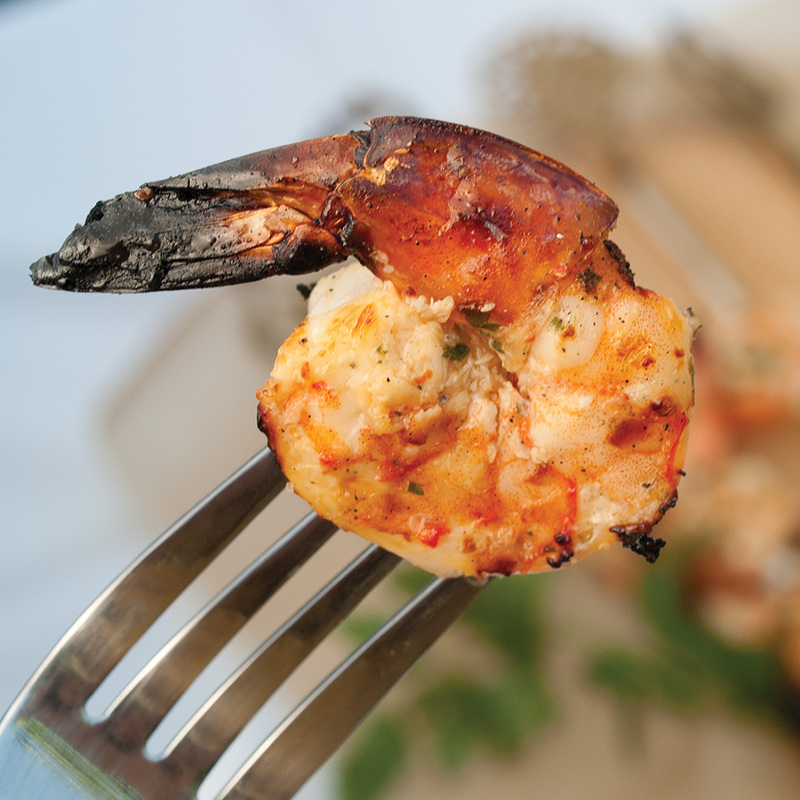 You can broil the shrimp for 3-4 minutes, or roast the shrimp in a 400F oven for 5-6 minutes. Any suggestions on what else to pair with these shrimp? Yes! Be sure to always look at the related posts at the bottom of the page—I usually put good sides there… the two I recommend are included there: Citrus Cauliflower Rice and Coconut-Almond Green Beans. Plain cauli rice or Zucchini Aglio et Olio (https://meljoulwan.com/2017/07/17/zucchini-noodles-aglio-olio/) would also be great. Just bought some scallops on sale (when did $18.99/lb become “normal”?? ), definitely using this preparation tonight but I just might double down on the red pepper flakes 😀 Thanks Mel!